The Fresh Princess has now officially retired. Please continue to explore the archives here, but to receive posts from my new blog, visit me instead at A Cat Called Custard, and click on the link there to follow. However, after careful consideration (and a seemingly endless process of procrastination), I’ve finally – reluctantly – decided that it’s time to say farewell to The Fresh Princess, and that this will be my final post. It hasn’t been an easy decision to make (it feels surprisingly like saying goodbye to an old friend) but, for me, The Fresh Princess is so closely related to a particular time and place, that it really has become stuck there. It makes sense to move on. But, after even more procrastination (which, incidentally I appear to be rather good at), I’ve decided that I will be starting a new blog. 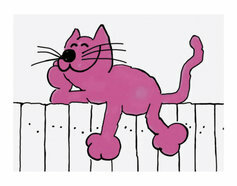 So, thank you to everyone who has read and / or followed The Fresh Princess, and I hope that you’ll all come and join me at my new site: A Cat Called Custard. 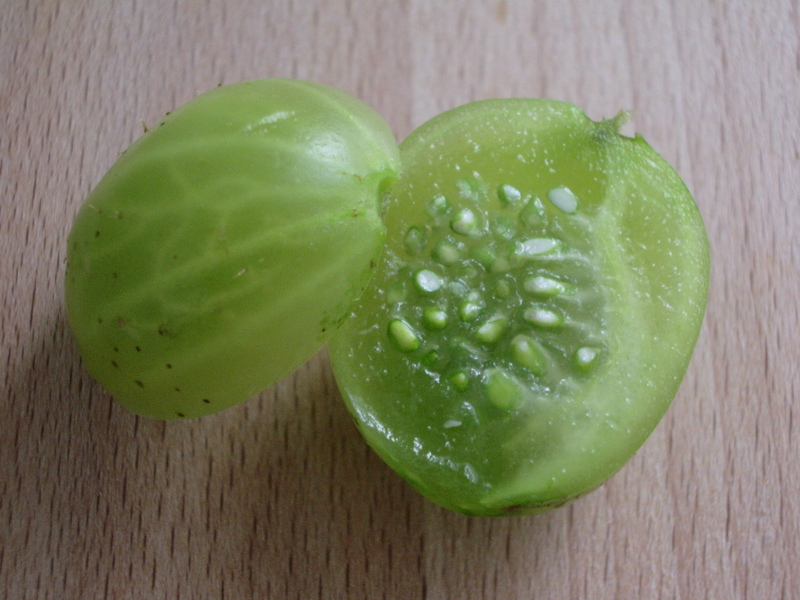 Like many other things, gooseberries are – at least to me – peculiarly associated with the British summer. I’m sure that I’ve never seen them in California, but perhaps I’ve just not been looking in the right places? It’s an intriguing fruit, and on first acquaintance doesn’t seem to have much potential. The bush from which it comes is a rather straggling, ungainly affair with branches that are punctuated by short, sharp spines capable of packing quite a punch. And in case you’re tempted to think that that’s the extent of their delinquency (and in the spirit of full disclosure), it’s also a pretty good description of the fruit itself, which is generally so tart – even when fully ripe – that it can’t possibly be eaten raw. It’s possibly the only summer fruit that you’re not going to be tempted to sample whilst picking. But it’s also incredibly beautiful, and beyond the sparse covering of short, sturdy hairs there is a firm, bright green, almost translucent berry – larger and denser than a grape – clearly patterned with a web of paler veins. Open it up and you’ve got something that resembles perfection. But of course, you’ve also got something that performs as a scary do-it-yourself prop, playing an almost exemplary role as the comedy “eye-ball”. As I mentioned earlier, it’s an intriguing fruit. But it’s also a versatile fruit and is used in countless desserts, including the classic gooseberry fool (where the fruit is poached, puréed and mixed with custard and whipped cream), as well as a flavourful filling for pies and crumbles. It’s also commonly made into jam or fruit wine, or a tart sauce to accompany savoury dishes, especially fatty meats such as pork and goose, as well as oily fish like mackerel. 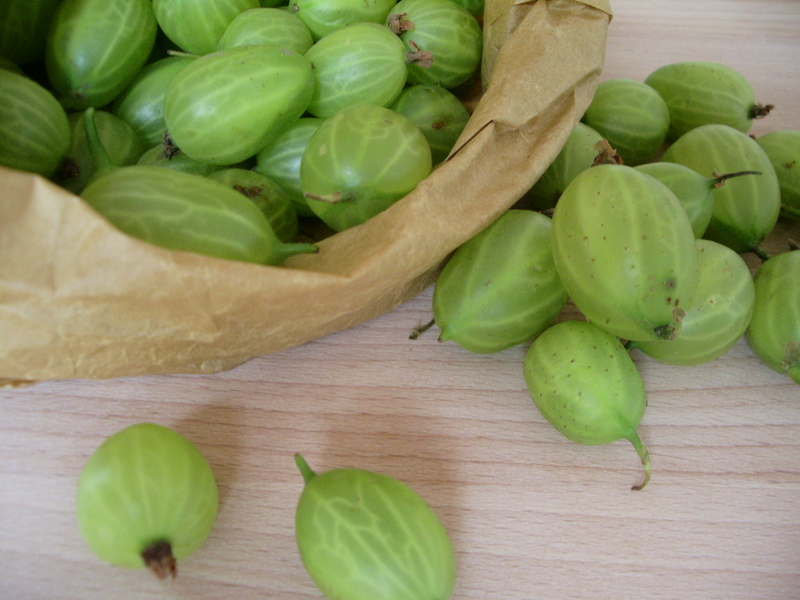 The gooseberries that I acquired from my greengrocer in early June were destined to go into a crumble, made with a beautiful sweet and nutty topping that goes incredibly well with this sour fruit. On a cooler day, I’m sure it would have gone well with custard. I’m told that it also works comfortably with a good vanilla ice-cream (if, of course, you like that sort of thing). 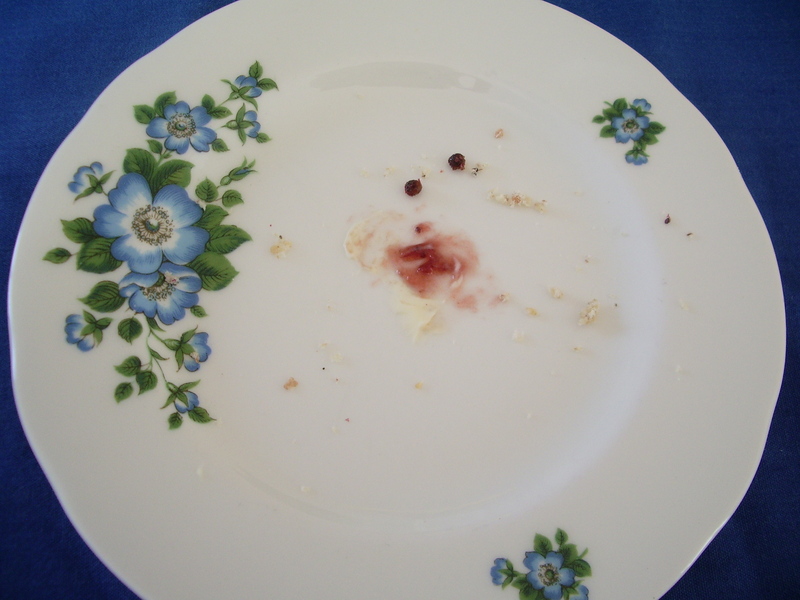 But for me – at least on this occasion – it had to be a generous (simple and delicious) dollop of clotted cream. Put the sugar, ground almonds and flour in a large bowl, and mix together completely (you can use your hands to do this). Add the diced butter and rub into the mix until it looks like rough breadcrumbs. Add the flaked almonds and roughly chopped hazelnuts, mixing everything together. Top, tail and wash the gooseberries. Place them into a serving dish (or several small dishes, as I did here), and sprinkle over the sugar, lemon juice and cinnamon. 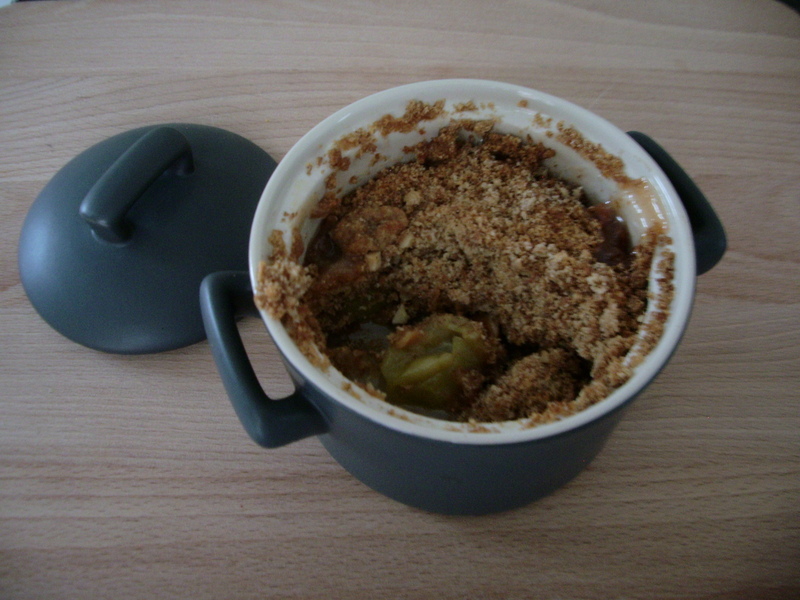 Cover with the crumble mix. Place in the oven for 25-30 minutes. 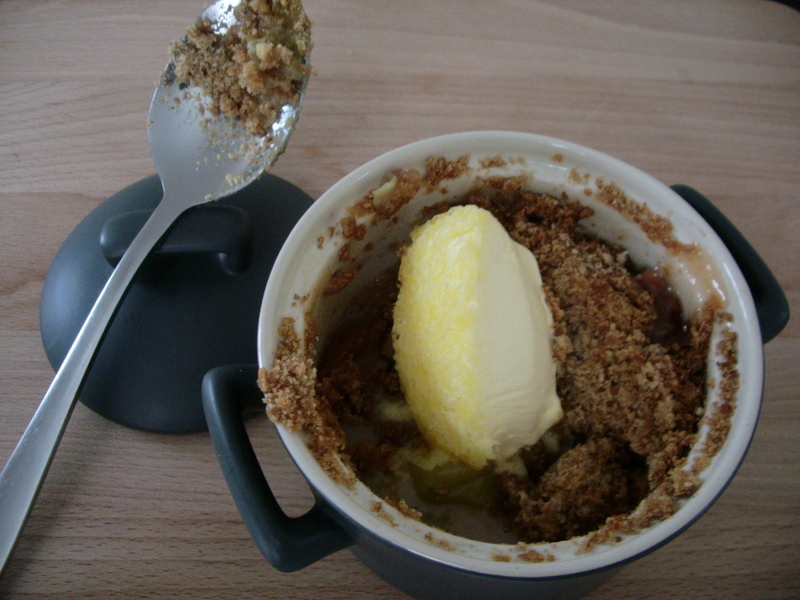 The crumble should be golden brown and bubbling. Despite Yotam Ottolenghi’s best efforts to raise the public profile of the humble cauliflower, the last decade has seen a clear and steady decline in its popularity. I was surprised to learn that sales in the UK have apparently gone down by as much as 35% over the past decade. Even Nigel Slater has stated that “cauliflower is something I can live without” (The Kitchen Diaries). Oh, Nigel. Really? And in leading a campaign for its revival, it must be safe to assume that Ottolenghi is facing quite a challenge. 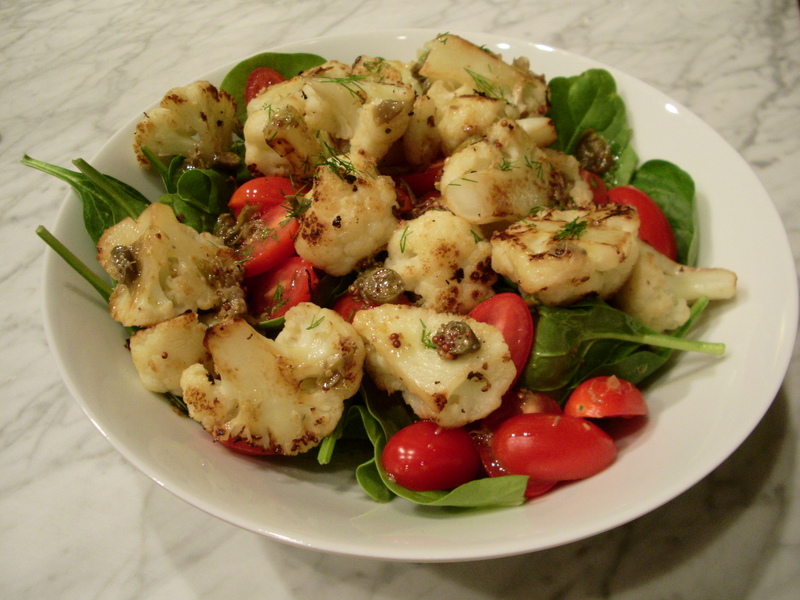 Not only does the cauliflower continue to carry considerable amounts of baggage from earlier decades (a bland, over-cooked past associated with the insipid gastronomy of school dinners), it also has to compete with the current popularity of its greener rivals; those vegetables – most notably broccoli, kale and spinach – that are venerated within the so-called “superfood” hall of fame. Cauliflower definitely seems to have lost out here, and to be honest I’m not exactly sure why. 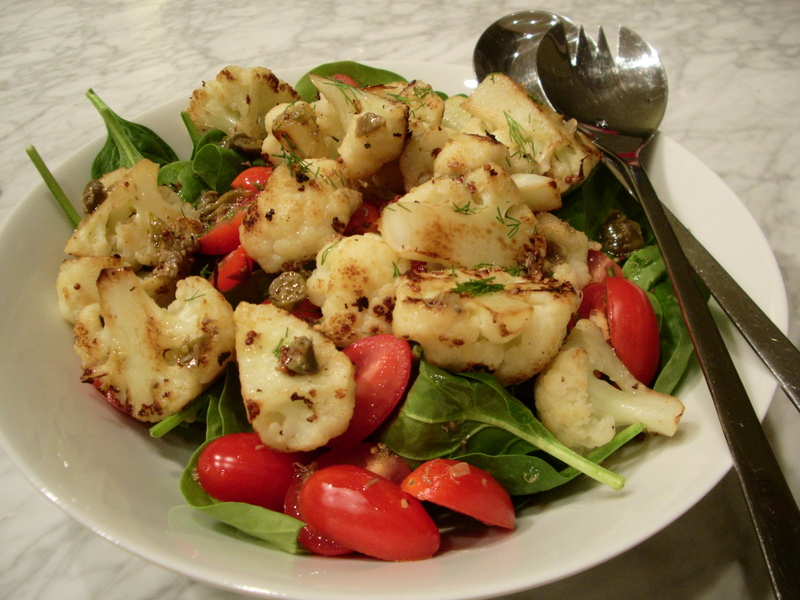 Begin by making the dressing… Mix together the capers, mustard, vinegar and some salt and pepper. Stir vigorously, slowly adding about half the oil to produce a thick and creamy dressing. You can do this in a food processor if you’d prefer, but it’s easy enough by hand. Adjust the seasoning to taste. Add the cauliflower florets to a large pan of boiling water and simmer for 3 minutes. Drain into a colander and run under cold water. Leave to dry. Once dry, place in a large mixing bowl with the remaining oil, as well as some salt and pepper. Toss well. Place a ridged griddle pan (or frying pan) over a high heat. Add the cauliflower florets a few at a time (making sure they’re not cramped), and turn them around as they start to char. Transfer them to a bowl as they are done. Add the dressing, dill, spinach and tomatoes. Stir together well and adjust the seasoning as required. This salad can be served either warm or at room temperature. It’s not often that the main ingredient in a chocolate cake is chickpeas (garbanzo beans), so when I saw this recipe I was absolutely intrigued. But in case that’s not enough to tempt you, I’ll also point out that it’s not difficult to make, has a wonderfully moist texture, and – perhaps most importantly – tastes great. Plus, if you’re making it to share with friends, then you’ve got the added bonus of challenging them to guess what the secret ingredient might be. (It’s unlikely that they’ll get it). And the icing on the cake? It’s also gluten-free. It definitely feels like a milestone. To some extent that’s because it has taken me longer to get here than I thought it might. (Given my initial trajectory, I should have reached this point almost a year ago). But I find that life is rarely predictable. 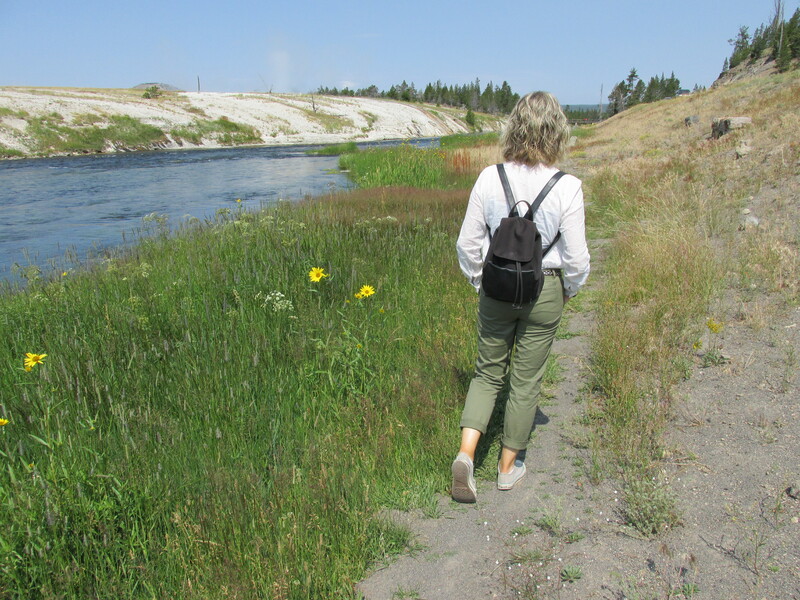 Some months have been more prolific than others – ranging from 0 posts in March 2014 to 19 in November 2012 – a fact that clearly reflects what has been an interesting, sometimes challenging, often very busy, but ultimately rewarding period in my life. It has been encouraging to gain followers and receive comments (any comments, actually, but especially those that recognise a post I’m particularly pleased with), and gratifying to hear that people have tried – and enjoyed – my writing and recipes. But it works both ways, and I also appreciate the intelligent, creative, humorous and thoughtful posts that I see on a regular basis. The ones I enjoy most include so much more than recipes, sharing tantalizing glimpses into the lives, families, cultures and kitchens of their authors. And then there is the cavalcade of carefully-constructed, mouth-watering photographs that frequently accompany them… I often wonder how many of us get to eat a hot meal anymore (or perhaps that’s just me)? Melt the chocolate in a heatproof bowl over a pan of gently simmering water. Remove from the heat, take the bowl carefully out of the water and stir until smooth. Leave to cool for 20 minutes. If the chocolate is too hot, it will melt the butter when added to the cake batter. Preheat the oven to 190C / 375F / gas mark 5. Grease a 23cm springform cake tin with a little butter and line the base with baking paper. Put the icing sugar, butter and chickpeas in a food processor, then blend together until creamy and smooth. Add the egg yolks and blend well. Next, add the cooled, melted chocolate in a steady stream with the motor running. Transfer the mixture to a mixing bowl. Whisk the egg whites in a large bowl until stiff (but not dry). Gently, but thoroughly, fold in to the chocolate and chickpea mixture. Spoon the mix into the prepared cake tin and spread to the sides. Bake in the centre of the oven for 35 minutes or until the cake has risen, is firm to the touch and just beginning to shrink away from the sides of the tin. Remove from the oven and leave to cool for 10-15 minutes in the tin. To make the whipped cream, mix the sugar and rum until it dissolves, then whisk with the cream until soft peaks form. 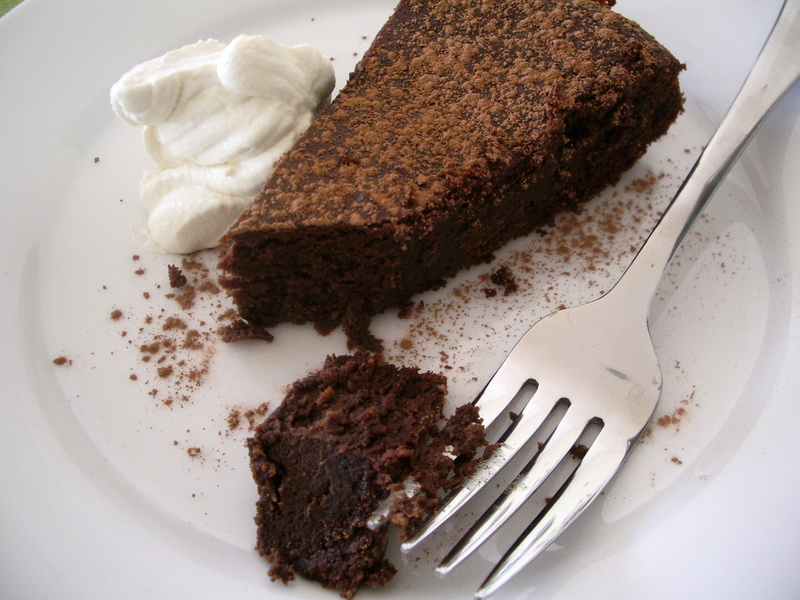 Serve with the warm torte cut into slender wedges and lightly dusted with cocoa powder. Yotam Ottolenghi claims that cauliflower is “one of the most magnificent of all vegetables” (The Weekend Guardian). In his writing, cauliflower is described as exciting and versatile – as magnificent, no less. In his recipes, it’s paired with ingredients that range from cumin, chili, paprika and saffron, to lemon, lime and pomegranate. It also goes well with nuts (especially, it would seem, hazelnuts and pinenuts), and – of course – with cheese. Overall, he claims, the cauliflower is deserving of far more credit and glory that it’s currently given. And treated in this sort of way, it’s easy – really easy – to see why that might be. But Yotam Ottolenghi is known for more than his fondness for a well-prepared cauliflower, and has established his reputation around a broad and innovative interpretation of traditional middle-Eastern flavours and Mediterranean cuisine. It’s food that he has described as being full of “harmonious contradictions”: vibrant, bold, familiar and comforting; peaceful and daring; dramatic and simple. His philosophy is to celebrate vegetables, and to use meat only for special occasions (rather than as an everyday ingredient). Based in London, he has established a small chain of delis (as well as a more formal restaurant), which are renowned for fresh, modern and complex salads as well as stunning, decadent desserts. He also has three best-selling cookery books, and writes a weekly column in the Saturday edition of The Guardian, many of which are available on-line. In this week’s edition he focused on the alphonso mango – his favourite fruit – and during the course of his article transported us to India and Bangladesh, discussed EU politics (surely they can’t really – apparently for reasons of health and safety – be considering banning its import into the UK? ), and presented us with three tantalising recipes that include both sweet and savoury dishes. Heat the oven to 180C/350F/gas mark 4. Put the butter in a medium saucepan on a medium heat. When it starts to foam, whisk in the mustard, herbs and a pinch of salt. Take the pan off the heat, leave for a couple of minutes to cool slightly, then stir in the ciabatta. Spread out on a parchment-lined baking tray and bake for 12-15 minutes, until crisp. Remove from the oven and set aside to cool. (Any that you don’t use can be stored in an air-tight container). Put the oil and butter in a large saucepan on medium heat. Add the thyme, parsley, ½ the lemon zest, onion, celery, bay leaves, caraway seeds, a good pinch of salt and some freshly ground pepper. Cook for eight – ten minutes, stirring often, until the onion is soft but has not taken on any colour. Add the cauliflower, potato and stock, bring to the boil, reduce to a simmer and cook for eight minutes, until the vegetables are cooked but still have some bite. Use a slotted spoon to lift a third of the cauliflower out of the pan – avoid removing any potato – and set aside. Let everything simmer away for another five minutes, then remove the bay leaves. 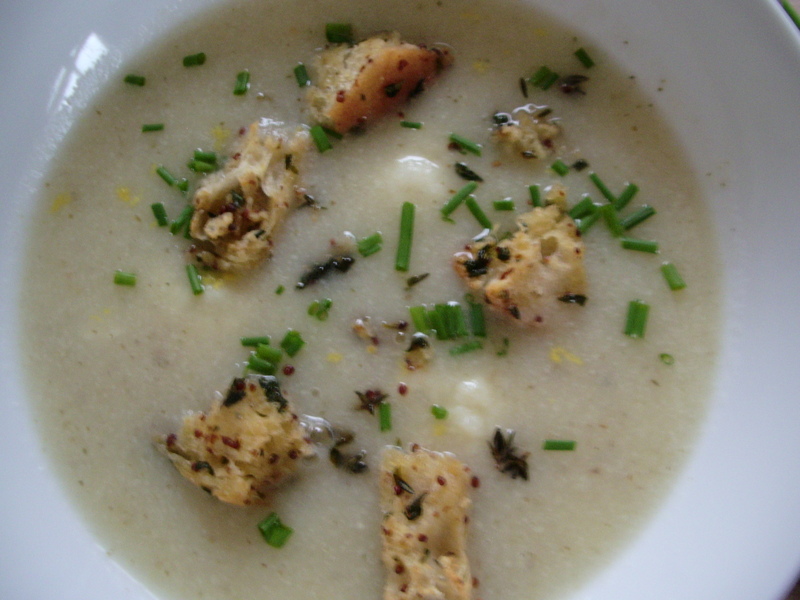 Using a hand-held blender (or a food processor), blitz the soup until smooth, return to the pan and add the reserved cauliflower pieces. 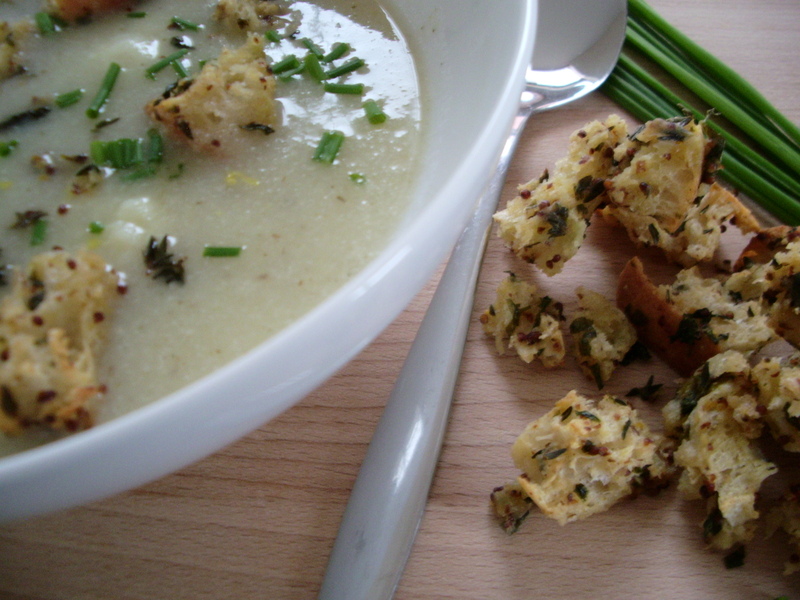 Stir in the remaining lemon zest and chives, and serve, sprinkling the croutons on top at the last minute. But joking aside, it remains that I really don’t like to spend much time in supermarkets, and playing my very own version of “Supermarket Sweep” – however sedately – does have its disadvantages. It’s an obvious mistake, but I’m usually in such a rush that (despite my carefully drafted list) I simply forget something that really would have been useful. So, I was particularly pleased last week, when I managed not only to spend a respectably short amount of time in the store, but also successfully completed my mission by getting everything that I needed. Brilliant! Sadly, however, my euphoria was short-lived, and as I unpacked my shopping was perplexed to find that instead of buying black peppercorns, I had actually managed to bring pink ones instead. It’s not exactly a big problem, but I found it irritating nonetheless. 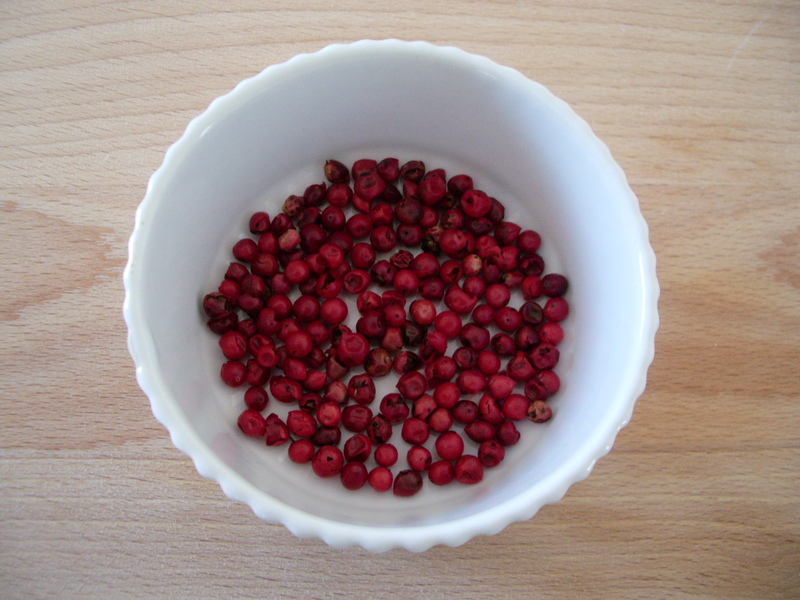 I’ve never purchased pink peppercorns before, and although they’re certainly delightful to look at, a quick search informed me that they’re no substitute for the black ones. 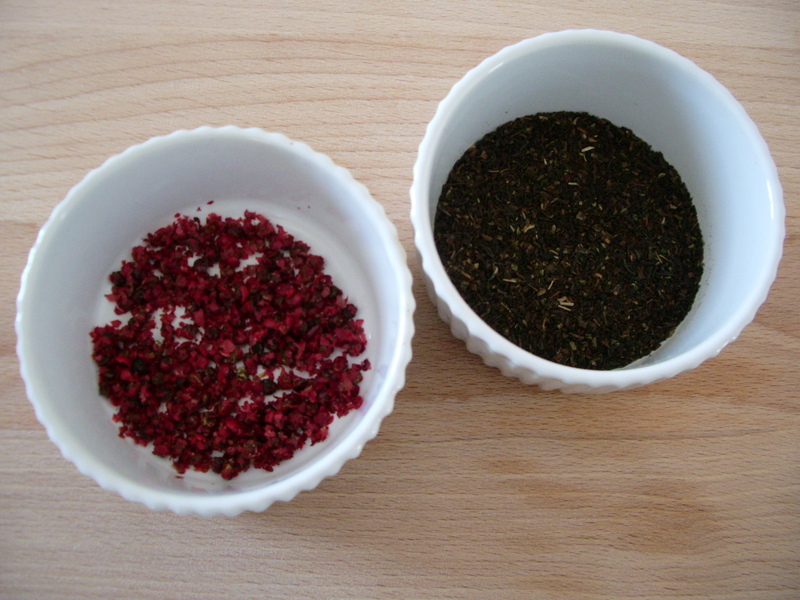 Although both are spicy and highly flavoured, pink varieties (which aren’t actually peppercorns at all), are more aromatic, with a citrus piquancy that means that they go well with fruit as well as desserts, rather than with savoury dishes. Although this was initially rather annoying, what it did mean was that I had the perfect excuse to look for a new recipe – one that made good use of my accidental ingredient. And eventually I came across this one, published in The Guardian. It’s a recipe for one of the scones available at The Modern Pantry, a café and restaurant which looks as though it would offer an incredible afternoon tea, and which is now firmly on my “to do” list next time I’m in London. 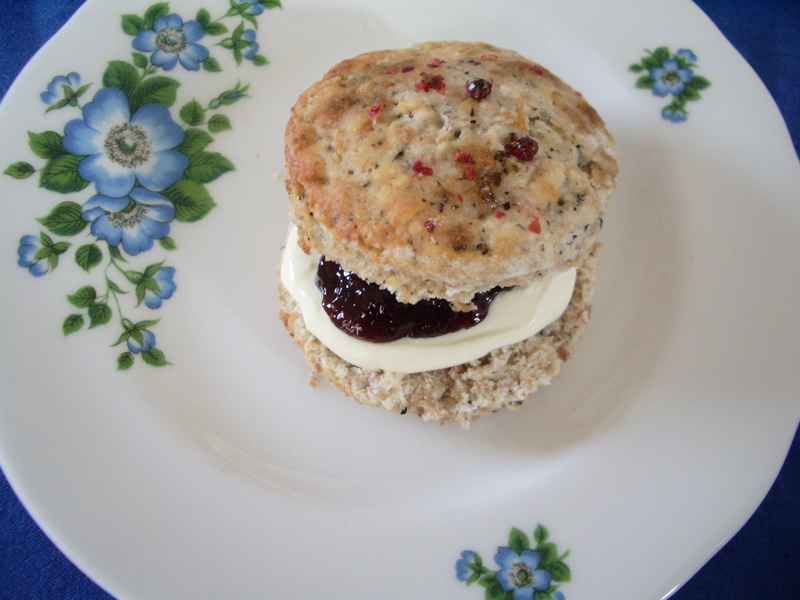 I was pleased with how these turned out, and they really do provide an interesting twist to a traditional British scone. The smell of the pink peppercorns was just fabulous, although a little disconcerting at times as I couldn’t help but wonder if they were going to overpower everything else. I worried about this twice – once as I was grinding them, and again as the scones were cooking – but I really needn’t have been concerned. Although they do provide some heat, there is also a surprising sweetness to them, and they go remarkably well with the Darjeeling. Which is just another thing that makes them perfect as an afternoon treat. Pre-heat the oven to 200c / 400f / gas mark 6. Mix the dry ingredients in a large bowl, then rub in the butter with your fingers to form a crumb-like texture. Gradually add the buttermilk until the milk forms into a dough. Roll out to 2cm think, then cut into 6cm diameter rounds. Put on to a baking tray lined with baking paper, brush with milk and sprinkle with sugar and a few peppercorns. Bake for 15 minutes or so, until light golden. 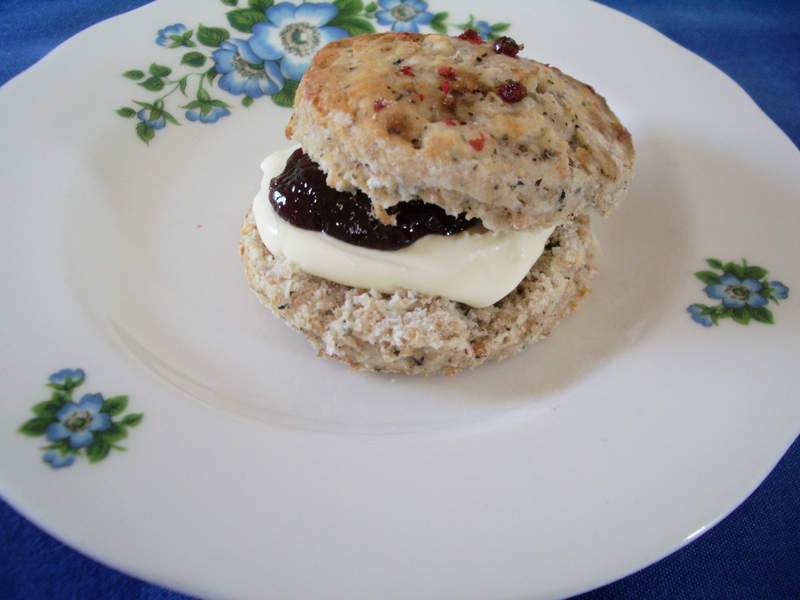 Cool on a wire rack, then serve with jam and clotted cream. Los Angeles, officially the City of Los Angeles, often known by its initials L.A., is the most populous city in the U.S. state of California and the second most populous in the United States, after New York City, with a population of 3, 792, 621 (2010 US census). Thursday: It’s too hot for a winter’s day. I’ve arrived after a ten-hour flight, and the world around me feels distorted. Out of focus. I haven’t had enough sleep and I’m fairly certain that it’s not the right time of day (night?). It’s disorienting. I’m disoriented. It’s loud as well. And everything around me – from cars to coffee cups – feels too big. Clumsy. I’m supposed to be meeting someone, but I can’t see him. He’s not here. There are too many people moving around me, and rooted firmly to the spot, I start to sway. Kelsey Grammer walks past, with a tiny baby strapped to his chest. This is definitely getting surreal. Los Angeles is a city that’s notoriously difficult to define. And probably impossible to understand. Which also means that it defies description. Of course, adjectives can help, but as everyone’s experience of this vibrant, exciting, glamorous, immense, isolating, empty, narcissistic “city” is different, they’re not actually very helpful. It’s certainly bizarre: a place where – thanks to the film and television industries – numerous imagined identities are imprecisely separated from these multiple realities; where the everyday often refuses to be normalized. Los Angeles is characterised most easily (perhaps), by contrast; by contradiction. A friend once told me that everything you hear about Los Angeles – from the entirely fantastic to the utterly and incomprehensibly dreadful – is probably true. It strikes me that this is a terrible burden for a city to bear. Malibu is an affluent beach city in Los Angeles County, California, United States. It consists of a 21-mile strip of prime Pacific coastline, and is famous for being home to Hollywood movies stars. Friday: It’s slightly warmer than it was yesterday, which seems to be the perfect temperature for a winter’s day. It feels as though the world around me has stopped. It’s quiet and calm. Peaceful. And given my proximity to the busy Pacific Coast Highway, this is rather surprising. It’s sunny, clear and bright. Focused. The ocean looks remarkable – it’s perfectly still – and although I know absolutely nothing about surfing, I’m certain there’s no possibility of “catching a wave” (is that right?) this morning. It doesn’t look real. The entire scene is totally unconvincing, and I’m reminded of the 1998 film The Truman Show, which ends as the protagonist – the appropriately named – Truman Burbank (played by Jim Carey), realizes that he’s spent his entire life in a television show, living on a film set that exists inside a dome built within the Los Angeles area. 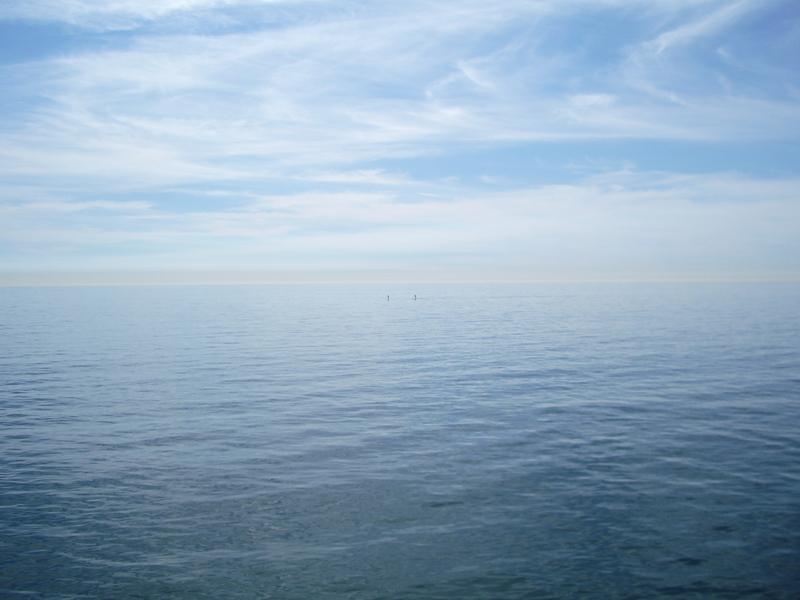 But in this edition – my edition – the sun is brighter, the sea is flatter, and the clouds look suspiciously as though they’ve been airbrushed on as an afterthought. 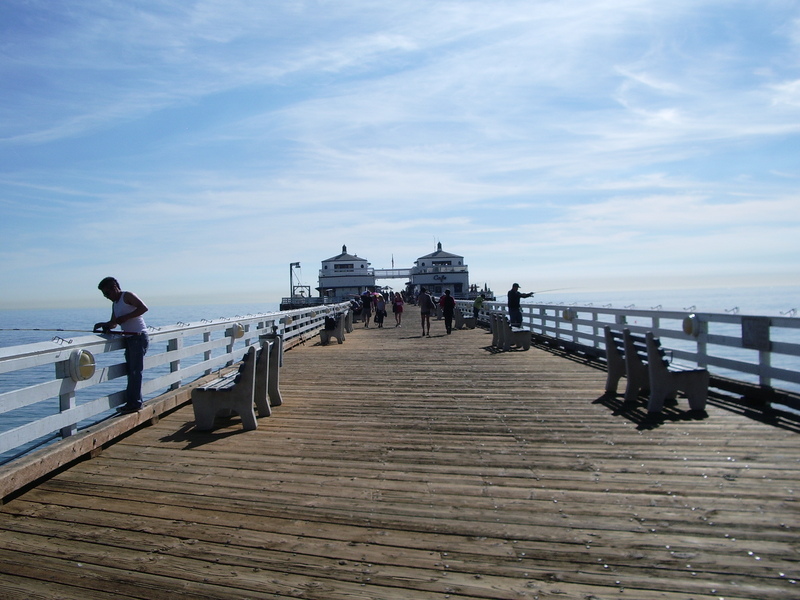 At the end of the Malibu Pier is the café to which I’m headed for breakfast. 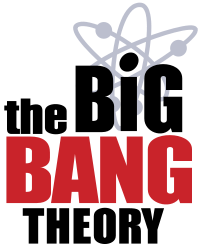 It’s a relative newcomer, but with an ethos summarized as “Fresh. Organic. Local”, and with a ‘casual’ décor that has been beautifully, meticulously, and deliberately designed, I can imagine that it’s going to be around for some time to come. It’s open from Wednesday – Sunday (9am-3pm), serving either breakfast or lunch. There is an excellent range of freshly squeezed juices, as well as teas and coffee. And it’s an interesting menu, too. Basic enough that it’s going to have a wide appeal, but unusual enough to keep people coming back. It’s not cheap, but to be fair the prices are similar to what you’d expect elsewhere in Los Angeles. 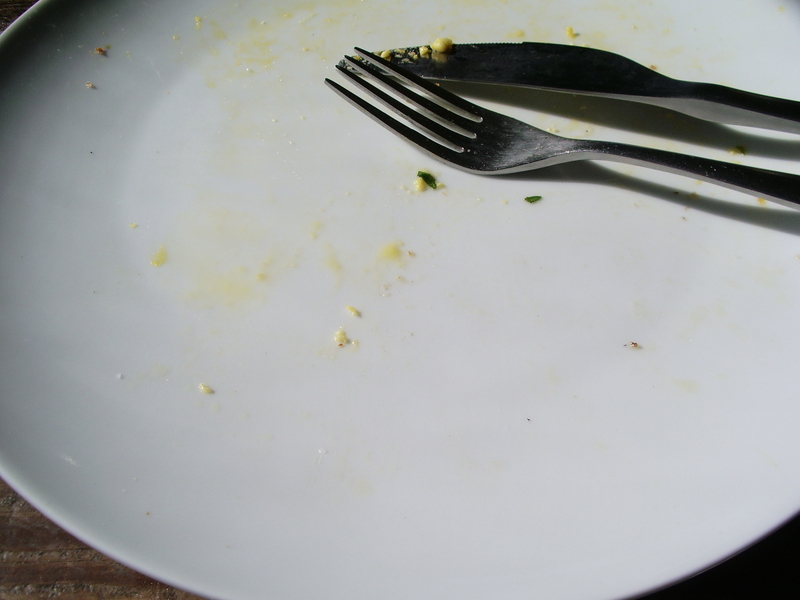 I had the farm scrambled eggs, smoked salmon and ricotta ($16.00), which was really very good, along with a filter coffee ($3.00). Following a recommendation, I also had the apple and kale juice ($6.00), although I was first tempted by the idea of the carrot, beet and orange. It was absolutely wonderful, and quite the thing to convince me that I should probably drink kale juice every day for the rest of my life. But that’s Los Angeles for you. The rest of the menu was appealing too, with items including multigrain pancakes with bacon bits and maple syrup, quinoa oatmeal with coconut milk, sandwiches (from fried egg, bacon and arugula to chicken, ricotta and bacon), and salads (including kale caesar and burrata served with seasonal fruit). 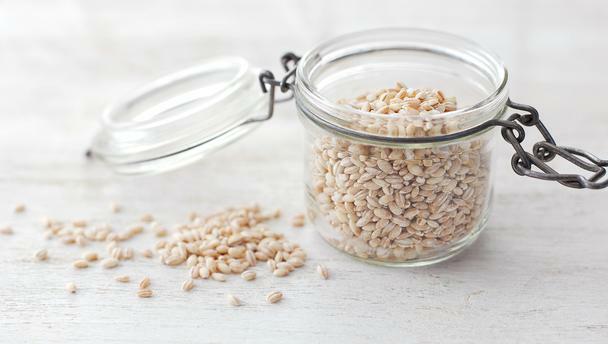 Pearl barley is a processed and polished grain that has had the hull and bran removed. It doesn’t have a particularly distinctive taste, and is commonly used in soups and stews as a thickener, where it adds texture and bulk rather than flavour. Perhaps not surprisingly, it tends to go unnoticed. Simply put, it’s an ingredient that fades into the background. It’s subtle, mild, under-stated. And to be perfectly honest, I’ve never really thought of it as particularly exciting. If you look at it carefully, you’ll see that it’s really rather pretty. The grains are small, delicate, shiny and white(-ish). They almost glow. I guess there’s a reason why it’s called pearl barley. But there’s also an unexpected lack of uniformity between the grains. As well as the overall iridescence, there’s quite clearly a spectrum of colour from white through to dark beige that’s really very pleasing. It also performs rather well in terms of nutrition. It’s relatively unprocessed, and is high in (soluble) fibre and protein, as well as being low in fat. Moreover, it’s straight-forward to prepare and cook, requiring nothing more than to be rinsed and then simmered in a pan of water. Despite some suggestions to the contrary, it doesn’t need to be soaked, although doing so will reduce the cooking time and it’s fine to do that if you prefer. If cooked properly, the texture of pearl barley should be associated with a slight bite, rendering it interesting rather than plain. Even the flavour improves on review, and rather than bland, it becomes slightly nutty. A bit like brown rice. Put all of this together and you get an ingredient that’s actually much more than the sum of its parts. 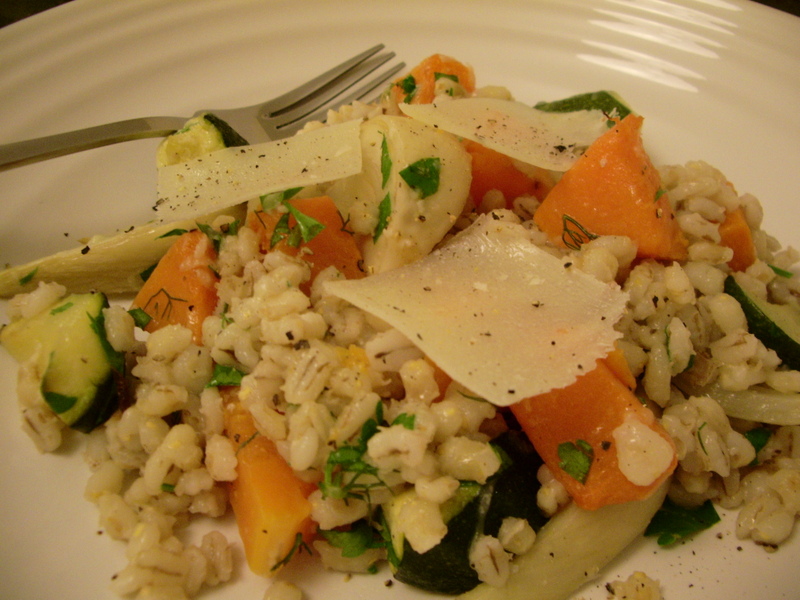 And the real beauty of pearl barley, I’m increasingly being led to believe, is its versatility. There is absolutely no reason at all why it should be limited to its role as a “filler”, or be confined to soups and stews. It works very well as an accompaniment to a whole range of meals, in place of other grains like rice and couscous, and it’s becoming increasingly popular in dishes ranging from salad to risotto. Here, it’s no longer seen as subordinate – a secondary ingredient playing a minor role – but instead is allowed to take centre-stage. And that’s exactly what it does in this recipe, a lovely dish that makes a really good (and substantial) supper or lunch, and which seems particularly fitting for winter. If you’ve got any left over, (ha!) it’s also great served at room temperature, and makes a tasty lunch-time salad. Pre-heat the oven to 190°C / 375°F / Gas Mark 5. Cook the rinsed pearl barley in plenty of well-salted boiling water until tender, but so that it still has a bit of bite; this will probably take about 45 minutes (if you’re not sure, check the packet for cooking instructions). 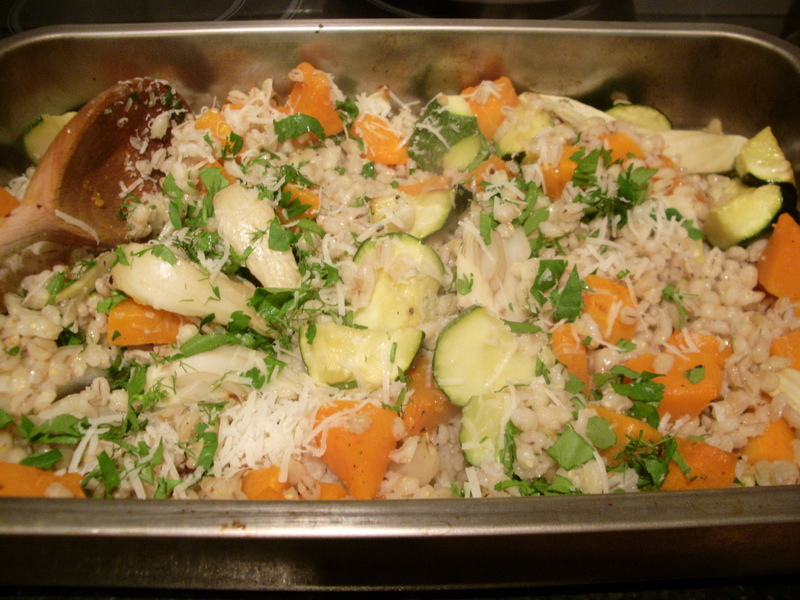 While the pearl barley is cooking, peel, halve and deseed the squash, then cut into chunks and scatter in a large roasting tin. Trickle over 2 tablespoons of olive oil and season well with salt and pepper. Toss so that the squash is well coated and put into the oven to roast. Cut the fennel lengthways into 6 or 8 wedges, and the courgette into chunks. Leave both to one side. After 15 minutes, add the fennel, courgette and garlic to the roasting tin and turn with the squash until everything is covered in oil. Roast for a further 30 minutes or so, until the vegetables are soft and beginning to caramelise around the edges. 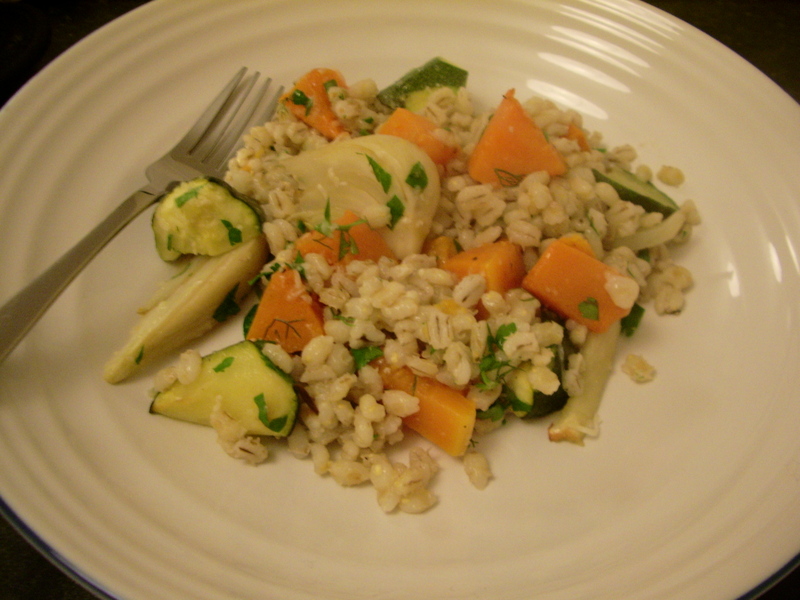 Drain the cooked pearl barley, and toss with the roasted vegetables in the tin. Add the lemon juice, cheese, parsley and any fennel fronds. Taste and season with salt and pepper. Shave over some more cheese and serve. Mulled wine is just one of the many traditions that I look forward to over the festive season. And although it is an apparently simple concoction made from red wine, gently heated along with mulling spices and a small amount of diced fruit, it is actually one of those recipes that people just can’t leave alone. So, while some believe that the mulling spices should be restricted to cloves, cinnamon and (possibly) nutmeg, others include allspice, cardamom and / or bay leaves. Similarly, although apples and oranges are almost universally added to this brew, lemons and limes regularly make an appearance as well. Everyone, it seems, has their own perfect formulation; some of which, incidentally, are far better than others. But despite this – the lack of precision, the quantity and even quality of ingredients (including the red wine) – it is also a drink that seems endlessly capable of providing cheer, comfort and goodwill on these cold and wintry nights. And without it, Christmas would doubtless seem just a little less shiny. I know that there are many who would totally disagree with me, arguing instead that red wine is rarely mulled well and provides absolutely no solace at all. Oh, seriously? Bah! Humbug! Having said that, mulled wine is not (at least for me), a drink for New Year’s Eve, when our mood should somehow be more frivolous. I did consider mulled white wine, which is something that I’ve yet to try. The recipes that I’ve found sound intriguing, full of sweet and spicy flavours that include cinnamon and cardamom, but also vanilla, honey and even star anise. But even this didn’t sound quite right for New Year’s Eve, when everything needs to feel lighter. This isn’t about feeling inconsequential or trivial – far from it – but somehow it does still need to be playful, optimistic, and positive. It almost goes without saying (doesn’t it? 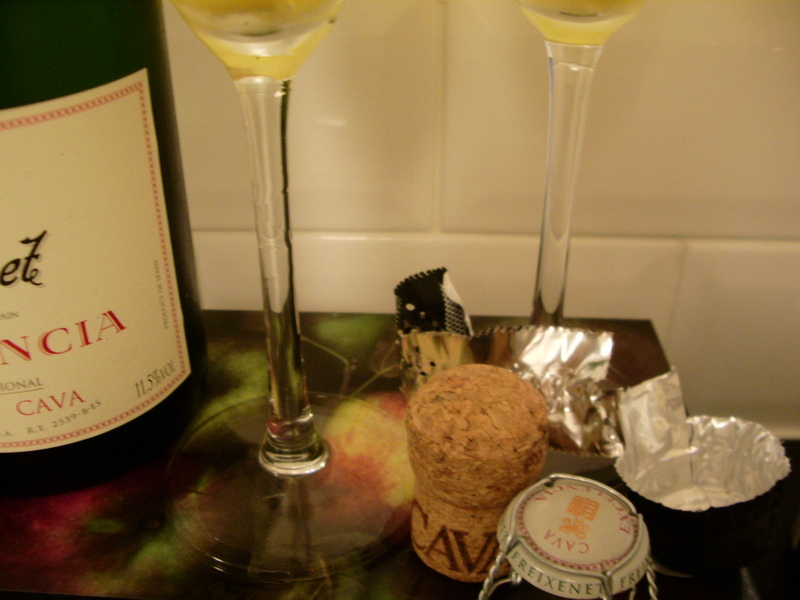 ), that the perfect drink for New Year’s Eve is sparkling wine. Inspired by all of this, I’ve taken the basic idea of mulled wine, and added fruit (pear poached with cinnamon and vanilla in a sugar syrup), to sparkling wine in order to make what I think is a fabulous winter cocktail, perfect for New Year’s Eve. It is a treat (vanilla pods are expensive, but are worth it just for the incredible smell that bursts out when you split the bean), and it is a drink that requires a certain amount of forward planning and preparation. But a New Year’s Eve celebration seems like the perfect occasion for that. Anyway, whatever you’re doing this evening, I hope that you have a wonderful time. Put the water and sugar into a small saucepan. Bring to a boil, stirring until the sugar dissolves. Add the vanilla bean and cinnamon stick. Cover, reduce the heat, and simmer for 15 minutes. Peel the pear, and slice in half lengthways. Remove the core. Add the prepared pears to the sugar mixture. Cover and cook over a medium heat until tender, probably about ten minutes. Remove the pear halves with a slotted spoon and place to one side to cool. Discard the cinnamon stick. Remove the vanilla bean and scrape out the seeds, stirring them back into the sugar mixture. Discard the vanilla bean. Bring the mixture back to a boil, and continue to simmer until it has reduced and looks slightly syrupy, which will probably take about 10-15 minutes. Remove from the heat and leave to cool. Put the pear halves and the vanilla syrup into separate containers and place in the fridge to chill thoroughly. Cut the pear into small pieces and put one (or a couple) into the bottom of a champagne flute. Add about 1 fl oz of the vanilla syrup. It’s a good idea to taste the syrup first. 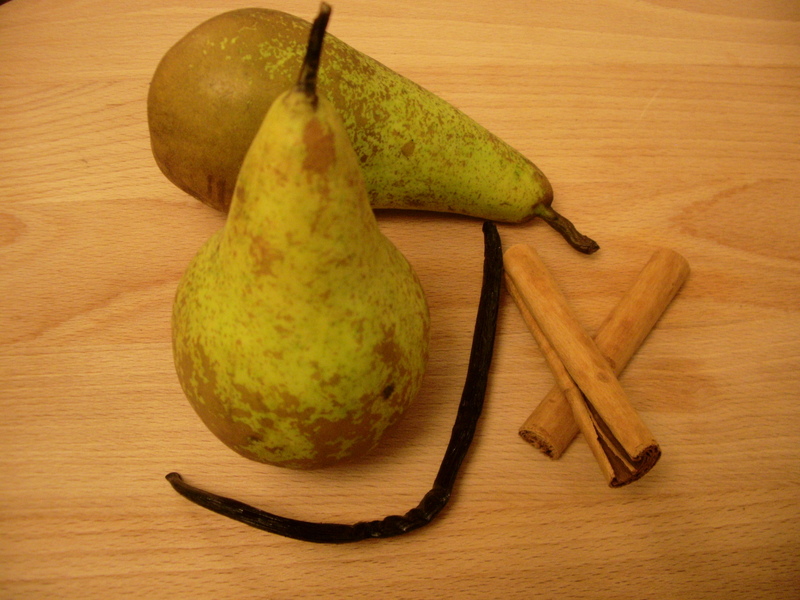 It is – of course – sweet, and has an intense flavour of both cinnamon and vanilla. You should be able to taste the syrup in the final drink, but you don’t want it to dominate. Exactly how much to add is really a matter of personal preference. Top-up with sparkling wine (of your choice). Sheldon: For the record, I only drink hot chocolate in months with an R in them. Whether you’re being playfully whimsical, or just downright logical, Sheldon is making an excellent point. (Well. Of course he is). And in the northern hemisphere at least, we’re now solidly into “hot chocolate” season – that time of year when this drink can really, truly be enjoyed. It’s the ideal (perhaps even perfect) thing to provide cheer when it’s cold and damp. It is, without doubt, a drink to warm the soul. And it’s not just about drinking it. There is also a fundamental pleasure in making it – in melting chocolate in hot milk – especially on a wintery day. It’s a relaxing process in itself. It should be appreciated for the simple luxury that it is, and lingered over accordingly. It should certainly never be rushed. Conventionally, hot chocolate (or drinking chocolate) consists of melted chocolate and milk. It is sometimes sweetened but this should be done mindfully, and only to the extent that is needed to melt away any residual edge of the chocolate’s natural bitterness. Hot chocolate is a dense and complex concoction that can taste of many things, but – even when sweetened – sugar itself should not be one of them. At its most bitter, hot chocolate is an acquired taste, and its consumption is in tiny amounts, served in suitably small vessels – a bit like the strongest espresso. A thimble-full would probably be enough (even too much) for the likes of me. I’m a firm believer in actually enjoying the taste of hot chocolate. It should be savoured. And it ought never to involve the kind of facial distortion that results from drinking neat gin. Although it was traditionally served cold, this is the brew that still retains a nod to the original Aztec notion of a chocolate drink, where cocoa seeds were ground into a paste, mixed with water and infused with chilli peppers to make xocolatl. And not only was it an extremely popular drink, it was also given medicinally, usually for stomach complaints. On the other hand, an ‘instant’ chocolate drink (or hot cocoa) is made from a cocoa powder that also contains sugar and milk. It does still have its place – it’s certainly convenient – but it’s important to chose your powder carefully, and those that are made with a decent quality of cocoa and don’t contain too much added sugar (or sweetener) are definitely superior. But for me, ideally at least, drinking chocolate is a compromise between these two extremes. And melting the chocolate really is a critical part of the whole relaxing ritual – it is infinitely more satisfying than adding hot milk (or water) to a powder. The texture needs to be rich, smooth, dense; the taste thick, intense and heavy with flavour. And it is the type and quality of the chocolate that determines this. Dark chocolate is definitely the way to go, and it should contain at least 70% cocoa solids. But it also has to be drinkable – too strong and it becomes unpleasant – and so it might (according to taste) be necessary to add some more sugar, or try it instead with a small amount of honey. 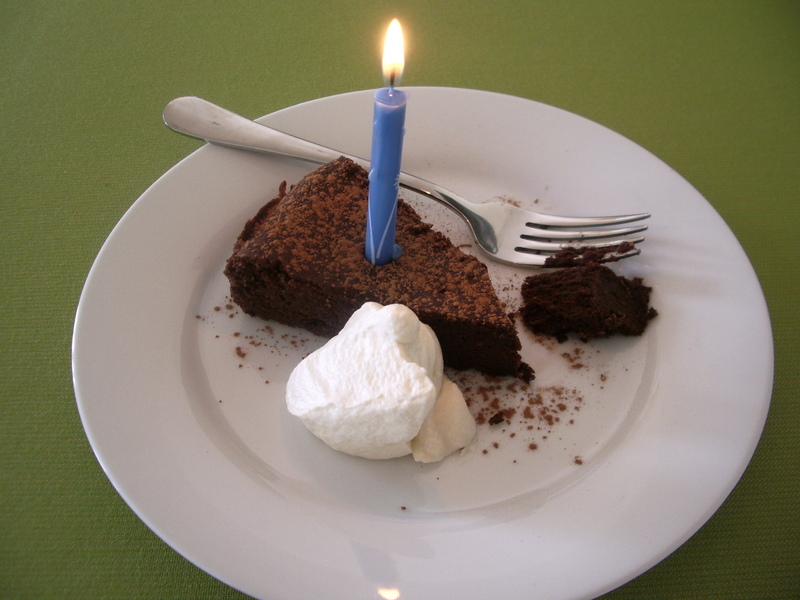 This is a simple – but good – recipe, and with the addition of chilli can be said to draw (at least to some small extent), on the Aztec tradition of xocolatl. But there are many ways to infuse a cup of hot chocolate, and if you don’t like the idea of the chilli then play around with other infusions and flavours – vanilla, orange or lavender are all fabulous – or keep it simple and make it with nothing but chocolate and milk. I find that there is no need for cream. It does not need a chocolate flake. And teeny-tiny marshmallows have absolutely no place at all. (Anywhere, actually. But certainly not here). Any kind of milk works here, so use whatever you would prefer. Mine was made with skimmed milk. I used Willie’s Cacao Chef’s Drops – 72% Venezuelan single estate dark chocolate, and which apparently has “complex nut and coffee notes”. All I know is that it tastes great. Check it out here. 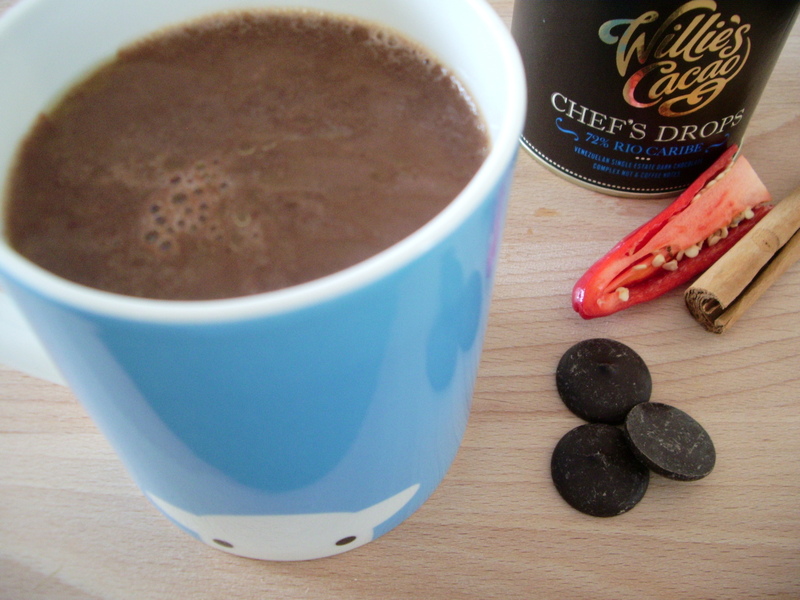 Put the milk into a small saucepan, along with the chilli, cinnamon stick and ground ginger. Place over a medium heat for 5 minutes, and then remove the chilli and cinnamon stick. Add the chocolate and stir until it has all melted into the hot milk. Keep stirring, allowing the milk to heat-up until it is just beginning to froth at the edges, but don’t let it boil. 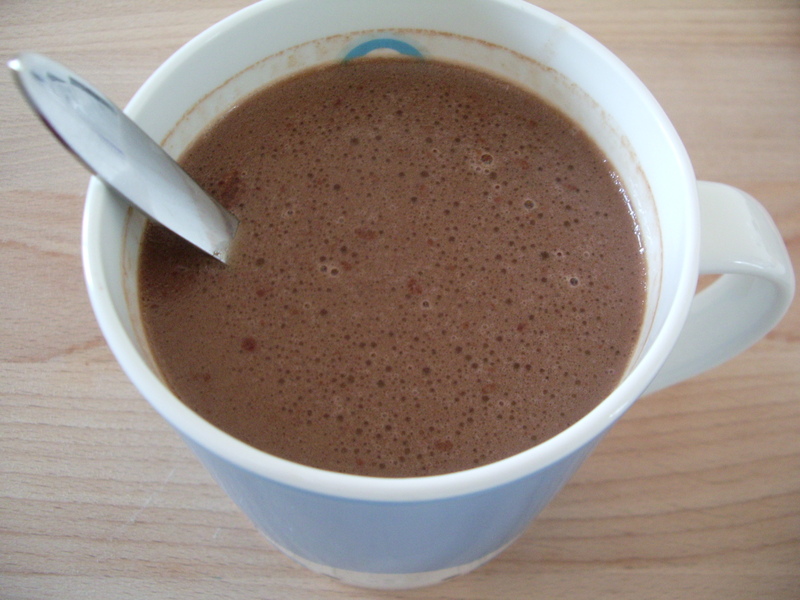 Pour the hot chocolate into two mugs, adding some honey to taste (perhaps ½ – 1 tsp) if you find that you need it. And enjoy!